F.E. Moran & F.E. Moran Fire Protection North Get Cook County Hospital Contract! F.E. Moran and F.E. Moran Fire Protection Northern Illinois are excited to be the design/build HVAC and fire protection contractors on the Cook County Hospital conversion to two new hotels. 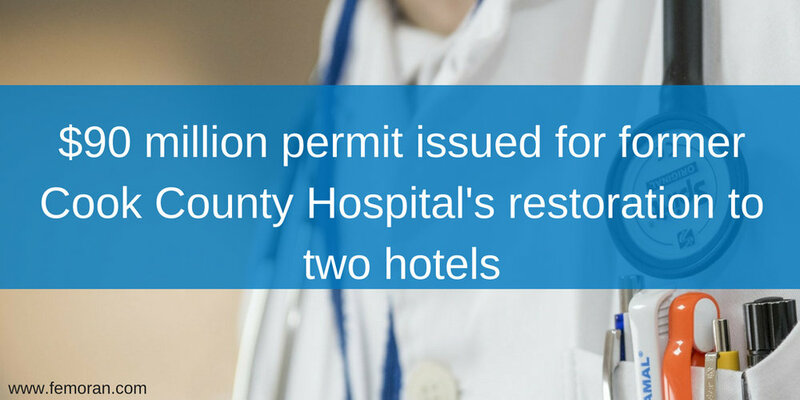 The $90 million building permit was recently issued for Walsh Construction to restore the vacant hospital and convert it to two hotels. According to Chicago Construction News, it will become a hospitality, office, and retail center. The hotels will be part of the Hyatt chain. A $90 million building permit has been issued for Walsh Construction Company II to restore the former Cook County Hospital’s long-vacant main building into two hotels. The eight-story, 345,000 sq. ft. structure at 1835 W. Harrison St. will become a “210 key hospitality, office and retail” structure, according to the recently issued building permit. In the past two days, FPN has been awarded two selective projects over $1 million. The first project is the Cook County Hyatt. They will be working with Walsh on that project. The other is OMNI's new 39-story residential high rise. Congratulations to Ken Votava on being awarded these projects. Thank you to Ron Cousineau, who was the foreman on two other OMNI projects and played a big role in helping them land the OMNI project. These jobs are great examples of how FPN is working as a team to get the right jobs. This is a great start to the year.